Tandem pair Lora Turnham and Corrine Hall and handcyclist Karen Darke both won time trial golds on the opening day of the UCI Para-cycling World Cup in Italy. Turnham and Hall, who won gold in the event at last year's World Championships, beat New Zealand's Emma Foy and Laura Fairweather by 23.83 seconds. Darke, who missed some of last season after a training crash, was dominant in the women's H3 category, winning by 32 seconds from Poland's Renata Kaluza. 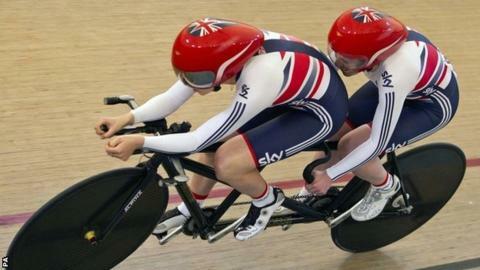 Turnham and Hall have made a quick switch from the track to the road after competing at last month's Track World Championships in Mexico. But they went around the course in 40 minutes 19.43 seconds with Britain's other pair Rhiannon Henry and Lauryn Therin in eighth. There was also bronze for David Stone in the men's T2 trike race. Stone, from Yorkshire finished in 25 minutes 18.48 seconds - nine seconds behind winner Ryan Boyle from the United States with Boyle's team-mate Steven Peace edging out Stone for silver. Of the other GB riders, Simon Price and Jon Gildea were seventh in the C2 and C5 categories respectively, while teenager Louis Rolfe was 15th in the C2 race and Brian Alldis 15th in the H4 event. Action continues on Saturday with the road races.